The landmark 2015 agreement didn't focus on agriculture. But that doesn't mean agriculture isn't deeply implicated in climate change. This helps to explain why most farmers voted for President Trump, who, as promised on the campaign trail, has now withdrawn the U.S. from the 2015 Paris climate accord. But how is agriculture actually implicated in the accord, and what does it mean for agriculture now that we’ve withdrawn? Historically, agriculture has not featured prominently in international climate agreements, and the Paris accord scarcely mentions it. Instead, the transportation, energy, and manufacturing sectors have been the chief targets for reducing greenhouse gas emissions, despite the fact that agriculture, forestry, and other land use activities are responsible for 24 percent of GHG emissions globally, on par with electricity and heat production (25 percent), and well above industry (21 percent) and transportation (14 percent). In the U.S., agriculture is responsible for about 9 percent of emissions. This omission is largely a reflection of food production being the most basic of human survival needs. It’s one thing to talk about “climate smart agriculture” in a country like the U.S., but in areas of the world where food security is a daily preoccupation for much of the population, there is little political will to impose regulations that could impact the ability of subsistence farmers to feed themselves and eke out a meager living – even if that means allowing practices like slash-and-burn agriculture, a major source of carbon emissions, to continue. Where agriculture is mentioned in the Paris accord, it’s in the context of making sure that efforts to curb emissions don’t inadvertently impinge on food security, as well as acknowledging that agriculture is one of the essential human pursuits that is most directly impacted by climate change. Based on this understanding, 40 countries signed a side agreement during the Paris talks agreeing to a goal to boost carbon sequestration in agricultural soils by .4 percent per year. Known as the 4 per 1000 Initiative, the idea is to minimize tillage, increase the use of cover crops and adopt other agricultural practices that keep carbon in the soil, where it is an aid to plant growth, and out of the atmosphere, where it causes global warming – an approach often termed carbon farming. The U.S. was not one of the signatories, however. Another way that the role of agriculture in global warming figured in the Paris climate talks: the Intended Nationally Determined Contributions (INDCs) submitted by most countries as a roadmap for how they will execute on their pledges to reduce emissions. According to an analysis by CGIAR, of the 162 INDCs submitted (all the EU countries are covered under a single INDC), 119 included agriculture as an area where they intended to make emissions reductions. Once again, the U.S., whose commitment under the Paris accord was to reduce GHG emissions at least 26 percent by 2025 compared to 2005 levels, was not one of those countries. Instead, President Obama’s plan to reach that target was mainly through policy measures to reduce vehicle and power plant emissions and to make buildings and appliances more efficient, a path summed up in the Clean Power Plan, which Trump has already begun to dismantle. Where Does Trump’s Decision Leave American Farmers? While the nation’s agricultural sector was not forced to reduce emissions through the Paris accord, as other industries were, the USDA did develop a number of programs during the Obama administration to encourage farmers to voluntarily reduce emissions and sequester carbon on their land. These are still in effect, though the 21 percent cut in discretionary spending that the Trump administration has proposed for the USDA may change that. 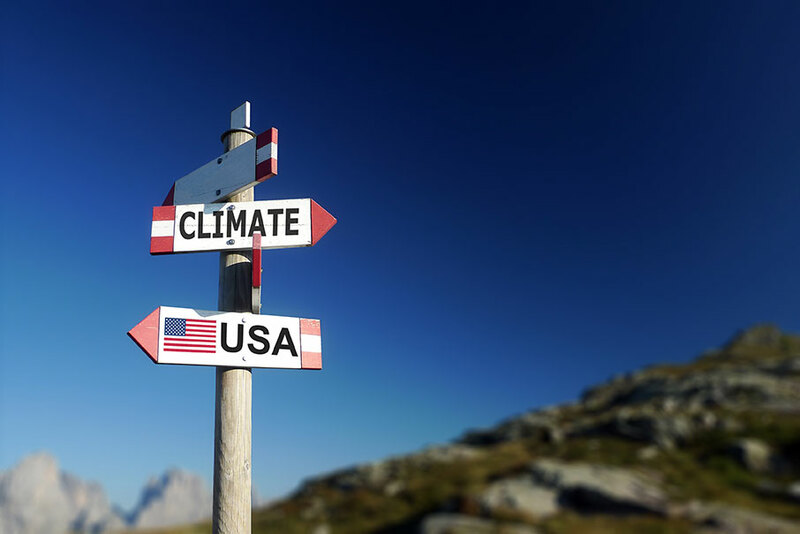 After the President’s announcement last week to withdraw from the Paris agreement, Sonny Perdue, the newly appointed Secretary of Agriculture issued a statement expressing his support for the decision. He recently stated, however, that “climate change is a fact,” words that directly contradict the President’s point of view, but he’s made it clear that he’s not convinced that humans are the cause, and is certainly not of the mindset that regulations are the answer, or that USDA funds should be spent to reduce agricultural emissions. Still, some of the USDA’s climate-related programs – such as those to encourage reduced tillage and increase the use of cover crops – are likely to continue, as they have many other benefits to farmers. Much will be determined in the coming year as the details of the 2018 Farm Bill are ironed out. One likely change is that references to climate change will slowly be purged from the USDA’s vast array of programs and online resources, even though the programs themselves may remain intact, as has already begun to occur at the EPA, the Department of Energy, and other federal agencies. This rebranding of the government may be as much about Trump stamping out the fingerprints of his predecessor as it is substantive changes in policy. Many state governments have a very different attitude about climate change than the President, perhaps none more so than California. Under the leadership of Governor Jerry Brown, the state has developed numerous programs to not only encourage climate smart farming, but is also dangling financial incentives to speed up the adoption of no-till techniques, methane digesters that capture greenhouse gases from animal manure and covert it to electricity, methods to reduce nitrogen fertilizer use (which emits nitrous oxide, a greenhouse gas), and other strategies to reduce emissions. California’s cap-and-trade market – a way for polluters to mitigate their emissions by purchasing carbon “offsets” generated by projects that reduce emissions – includes the agricultural sector, enabling farmers to get paid for climate-friendly practices. While the polluters must be in California to participate, farmers throughout North America are eligible to reap the rewards of the state’s carbon market. Of course some farmers want to do the right thing whether they get paid for it or not. And the good news is that organic and sustainable practices tend to have a lower carbon footprint than conventional agriculture. Increasing organic matter in the soil, one of the basic tenets of sustainable agriculture, is also a method for sequestering carbon. It’s a win-win. So as long as the demand for organic food continues to grow, the impacts of agriculture on global warming should slowly diminish.